The Directors of SKA Organisation held a meeting at the SKA Global Headquarters, United Kingdom on the 26th and 27th of March 2019 for the 29th meeting of the SKA Board of Directors. Catherine Cesarsky, Chair of the Board, welcomed directors and invited guests to the 29th Meeting of the Board of Directors of SKA Organisation. At this meeting, the appointment of Kristine Spekkens as Science Director for the National Research Council of Canada was approved, with effect from 19 March 2019. The Board noted that Max-Planck-Gesellschaft zur Förderung der Wissenschaften e.V. (MPG, Germany) applied for Special Membership of SKA Organisation on 25 March 2019. The Board noted that Alistair McPherson, Deputy Director-General, and Gary Davis, Director of Operations Planning, retire at the end of March 2019; it thanked them both for their contributions to the SKA project. Philip Diamond reported on project Health, Safety and Environmental (HSE). Since the last Board meeting, there have been no significant reportable accidents or incidents recorded at SKA HQ. In terms of project safety, the Project Safety Management Plan (Rev 2) and the Environmental Management Plan (Rev 1) are now expected to be released in 2019Q2-3. A Safety in Design compliance report, including Observatory Hazard Safety Log, will be presented to the Adoption Design Review panel on 12 July 2019. An impact analysis across media outlets of the SKA Observatory convention signing ceremony in Rome on 12 March 2019 was presented by video. In terms of traditional media, the total potential reach of the news of the event was over 200 million people, with more than 270 articles published in 20 countries. The press release on the SKA website alone was read more than 2,000 times. In addition, there was much activity on social media, including live broadcasts of the event via the SKA website and in China. There were reactions and congratulations from around the world on the SKA’s social media pages. Engagement with potential new members of the SKA project continues. Germany, Japan and Portugal were all represented at this Board meeting and apologies were received from Switzerland. The Board noted that Portugal has now signed the SKA Observatory Convention. 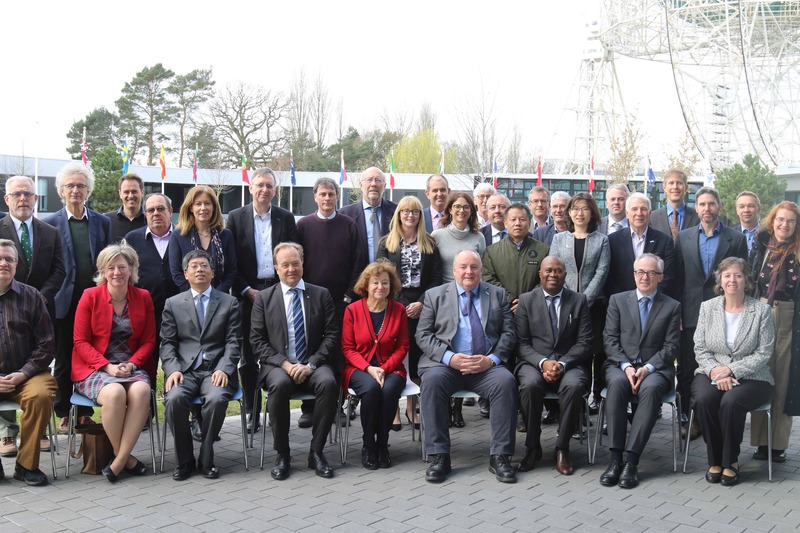 The Board was updated about key strategic issues following signing of the SKA Observatory Convention and establishment of the Council Preparatory Task Force (CPTF). The CPTF held its inaugural meeting in Rome, Italy on 13 March 2019 and confirmed the focus of its activities to be the development of a funding schedule, establishing principles governing Associate Membership, and finalisation of key documentation such as procurement strategy and IP policy. Other strategic issues include development of plans for the SKA Regional Centres (through a newly formed SRC Steering Committee) and the continued development of a detailed operations plan. Robert Braun, Director of Science, reported that 2018 was a busy year for the science team, which undertook 29 SKA presentations in 13 countries and refereed 42 research publications. He noted that more than 300 people have registered for the SKA General Science Meeting and Key Science Workshop on 8-12 April 2019. This event will be held at Alderley Park, near SKA HQ. An overview of planning for the SKA Data Challenges was submitted to the Board. There will be close co-ordination of the SKA data challenges with complementary external initiatives. The first SKA Science Data Challenge was released in November 2018; it consists of source finding, characterisation and classification within simulated broad-band continuum images. The deadline for submissions has been extended to 15 April 2019 and, to date, 13 teams from Europe, Canada, Australia, India, China, South Africa and Chile are participating in this data challenge. The Board was informed that the Pre-construction mission is to deliver an approved construction proposal and operations plan, whilst the Construction mission will be to deliver the full scope of the deployment baseline on budget and schedule. The construction proposal will provide a summary of the scope, budget and schedule for the SKA-1 deployment baseline along with the management processes necessary to achieve it. Adoption Design Review (ADR) meetings will be held at SKA HQ on 15-19 July and 29 July – 2 August 2019 to assess the completeness of the design and plans for construction and to demonstrate that the remaining risks are acceptable before moving forward with the System CDR. ADR will establish a complete set of documents representing the requirements, design, internal interfaces, lower level requirements and all plans. Dr McMullin stated that convergence between finalisation of the system design and establishment of SKA Observatory IGO has eliminated the need for early construction activities in the company-era. Early construction activities have now been incorporated into construction planning as an integral part of the roll-out (Array Assembly 0.5, AA0.5) in mid-2023. Thus, AA0.5 will enable astronomical commissioning observations to start approximately 12-18 months in advance of the original plan. AA0.5 will provide key risk mitigation activity for the project execution and potentially reduce the construction schedule. Element CDRs are progressing well and, with the exception of Dish, all are expected to have closed out CDR actions by 31 May 2019. CDR close-out for Dish element is expected to be completed by 26 November 2019. The Board supported efforts to resolve outstanding IPR issues to enable completion of the SKA-1 design. In terms of preparations for System CDR, the relevant documentation is scheduled for release on 13 September 2019, in advance of the System CDR on 2-5 December 2019. A detailed SKA-1 System CDR plan and procedures document is currently in draft form. Bridging activities are progressing well, with priority being given to preparations for the System CDR. Dr McMullin noted that further progress has been made since the last Board meeting, with regards to bridging partners (“Consultants”) signing bilateral agreements (Memorandum of Understanding) to undertake bridging work. The SKA Engineering Meeting 2019 will be held in Shanghai on 25-28 November 2019. The theme of the meeting is the SKA system design, operations and plans. The Board noted the challenges of resource constraints on both the SKA Observatory Development Programme (SODP) and the Advanced Instrumentation Programme (AIP). It confirmed that the development programmes remain an important aspect of the project but are lower priority than funding and construction of SKA-1. Dr McMullin reviewed the status of the construction cost estimate. The impact of the construction cost estimate on the proposed scale of the deployment baseline will be reviewed after System CDR. Prof. Diamond presented a summary of current cost estimates for ‘Construction’ and ‘Observatory and Telescope Operations’ and ‘Development’. He proposed modifications to the budget structure in order to more accurately reflect the functions to be carried out by the SKA Observatory. He stressed that these changes will not impact the overall costs of SKA-1; the proposed change in classification of costs would improve transparency by more accurately reflecting the functions of the SKA Observatory and would also better adhere to best practice accounting standards. The Board requested a more detailed proposal for consideration at its next meeting. Gary Davis, Director of Operations Planning, presented a first draft Operations Plan to the Board. An independent Operations Review of the full Operations Plan is scheduled to be held in 2020Q1. The final Operations Plan will be submitted to the SKA Observatory Council at the end of 2020Q2, together with the Construction Proposal. The Board noted that the present Observatory budget in the Operations Plan covers SKA office costs to support the construction and development programmes, costs to operate and maintain the two telescopes and operating costs for the SKA Observatory as an organisation. It is forecast that an Observatory budget of €92M per year will be needed for the design baseline by 2030, not including a development fund. Operations workshops being held for SKA-mid (Cape Town, South Africa on 20-22 February 2019) and SKA-low (Perth, Australia on 11-14 March 2019). Prof. Davis felt these meetings to be extremely useful in building relationships for future partnerships. Prof. Davis presented an update on planning for the SKA Regional Centres (SRCs). He noted that, at its last meeting, the Board approved the dissolution of the SRC Coordination Group (SRCCG) and its replacement by the SRC Steering Committee (SRCSC). Latterly, the work of the SRCCG focussed on the development of a position paper on future policies for Advanced Data Products. This work was presented to the Board in the SRCCG’s final report. The Board thanked the SRCCG for its work. The SRCSC is a partnership of emerging SRCs and the SKA Office, with representation from 11 member countries and the SKA. The SRCSC held its first meeting at SKA HQ on 19-20 March 2019 to review its terms of reference. Its mission is to define and create a long-term operational partnership between the SKA Observatory and independently-resourced SRCs. The SRCSC will be superseded in due course by the operational partnership that is formed as a result of its work; it will report directly to the Director-General. The Board approved the SRCSC’s terms of reference. During discussions on procurement at the last Board meeting, the SKA Office was asked to explore a range of potential procurement models, from fully allocative to fully competitive. Ian Hastings, Head of Procurement Services, presented the outcomes of this work, which explored an allocative model, a hybrid allocative model with bilateral negotiations, a work return competitive model and a fully competitive model. At its last meeting, StratCom had instructed the SKA Office to further develop the hybrid allocative (“hybrid”) model, which it felt could reconcile Member’s needs for both allocative (negotiated) and competitive procurement to co-exist in parallel. Under the hybrid model, the default position would be competitive procurement, but Members could formally request an allocation(s). A conditional allocation may be made, which would be subject to the outcome of negotiations between the SKA Office and all affected Members. At the end of the negotiation process, the SKA Office would submit a recommendation to the SKA Observatory Council which would decide whether or not to approve the conditional allocation on the terms negotiated. The hybrid model can accommodate both in-kind contributions by Members and traditional cash procurements by the SKA Observatory. It reconciles Member work-return aspirations by providing a mechanism to allocate specific construction work-packages to particular Members and also enables the SKA Observatory to establish workable agreements with Members in order to manage procurement risks appropriately. Procurement policy and procedures are being drafted to align with the hybrid approach. The Board was broadly content with the ‘direction of travel’ of procurement planning. Daan du Toit, Chair of StratCom, reported on the Committee’s meeting at the Tata Institute of Fundamental Research, Mumbai, on 29-30 January 2019. At this meeting, discussions included: (i) early construction opportunities, (ii) operations in host countries, (iii) transition activities, (iv) the Council Preparatory Task Force, CPTF, (v) the initial funding schedule, (vi) Associate Membership of the SKA Observatory, IPR, operations and access policies, and (vii) procurement, The Board discussed the issues arising from the report. It was agreed that StratCom should not meet again unless specific work is identified in future that requires its attention. The Board thanked StratCom for its very effective work over the years. Simon Berry, Director of Strategy, presented an update on progress to develop a partnership model to deliver the operations of SKA-Mid in South Africa and SKA-Low in Australia. A key driver for development of the partnership model is concern that the previous scenario considered, i.e. implementation of service level agreements with site operators, might lead to conflicts of interest between ‘operating parties’, their ‘national owners’ and the SKA Observatory as ‘client’. Since June 2018, a number of meetings have been held between the SKA Office and representatives of South Africa and Australia and their respective operational entities SARAO and CSIRO to explore potential modes of partnership. The result is a draft proposal for two partnerships agreements; one between the SKA Observatory and CSIRO as the delivery partner in Australia for SKA-1 LOW, and the other between the SKA Observatory and SARAO as the delivery partner in South Africa for SKA-1 MID. The partnership model will be finalised and submitted to the Board for endorsement at its next meeting. Simon Berry reported that the SKA Observatory Convention was signed in Rome on 12 March 2019 by Italy, China, Australia, South Africa, The Netherlands, Portugal, and the UK. At the signing ceremony, the Final Record, a formal record of the negotiations, documentation and national statements, was signed by all participants in the negotiations and Portugal. The CPTF held its inaugural meeting in Rome on 13 March 2019. It was attended by signatories of the convention, countries with a bona fide intention of signing the convention, and observers. The CPTF discussed its work plan for the next 12 months and identified the following priorities: initial funding schedule, principles for Associate Membership of the SKA Observatory, and finalising the key policy documents (e.g. procurement and IP). The CPTF appointed Daan du Toit as its representative on the Joint Working Group for Transition (JWGT). The respective roles and responsibilities of the Board and the CPTF were discussed in terms of preparations for the SKA Observatory and management of pre-construction activities. Theresa Devaney, Head of Business Development and Change, reported on the status of planning for the transition from the SKA Organisation to the SKA Observatory. She reviewed the key transition planning highlights in terms of legal and governance issues, change management, continuous improvement and establishment of the SKA Observatory as an operational entity. The current working assumption is that formal transition processes will be completed by September 2020 and that the SKA Observatory will become operational in 2020Q4. During transition period the governance framework should ensure that interests, rights and obligations of the SKA Organisation and the future Observatory are represented. The JWGT will be established as soon as practicable to facilitate the relationship between the SKA Members/Board and the CPTF; it is anticipated that its inaugural meeting will be held in April 2019. The JWGT will be co-chaired by Catherine Cesarsky, Chair of the SKA Board, and Patricia Kelly, Chair of the CPTF and comprise a small executive group from the Board and the CPTF plus the Director-General. The Board noted the revised terms of reference for the JWGT, which has been endorsed by the CPTF, and appointed Filippo Zerbi as its representative on the working group. Alistair McPherson, Deputy Director-General, informed the Board about minor changes made to the Business Plan 2019-20 since its approval by the Members in December 2018. Fiona Davenport, Head of Human Resources (HR), presented an update on implementation of the current HR plan, including recruitment, retention, staff engagement and development of the future organisational design. Feedback from the recent staff engagement survey and follow-up staff workshops has been incorporated into a 12-point action plan. A Staff Forum will be launched in April 2019 to help improve future engagement with staff. Implementation of an Enterprise Resource Planning (ERP) system at SKA HQ, with associated processing mapping and development of workflows in the HR module is on track for ‘go live’ in early-April 2019. A recruitment module of the ERP system is scheduled to be launched in early-May 2019. David Luchetti, Chair of the SKA Finance Committee, presented a report of the Finance Committee meeting of 2018. Following the Committee’s recommendation, the Board approved the external audit plan for the year ended 31 December 2018. It also approved minor changes to the Finance Committee’s mandate, terms of reference and rules of procedure. The Board approved the appointments of Sam White (Department of Industry, Innovation and Science, Australia) to the Finance Committee and Marc-Antoine Miville-Deschênes (National Centre for Scientific Research, France) to the Science and Engineering Advisory Committee. SKA-BD-31: 19-20 November 2019 (Nice, FR).